At the head of Steedman’s division, Whitaker’s brigade forms into a double line of battle on the run. 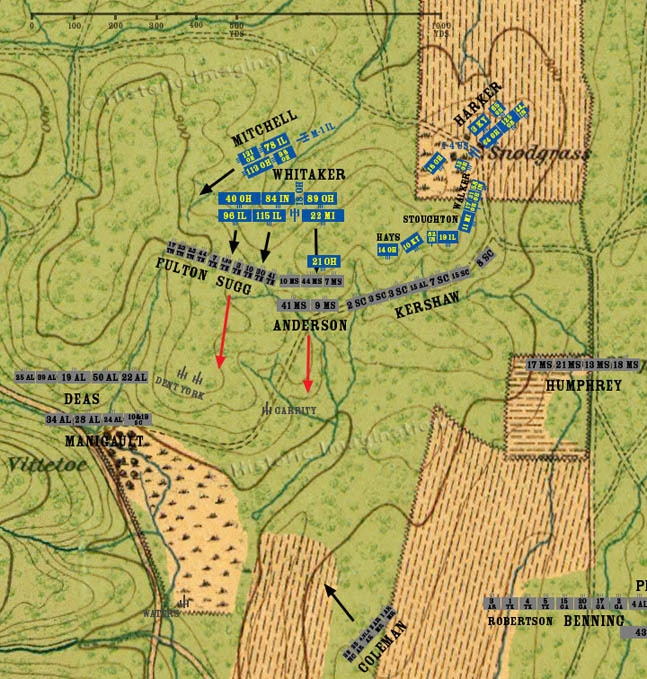 As soon as they are formed, they charge up the slope of Horseshoe Ridge into Johnson’s Division and Anderson’s Brigade. Sugg’s brigade is pushed off the slope. The 22nd Michigan charges through the 21st Ohio and into Anderson’s Brigade. The sudden charge of the fresh Union regiment sends Anderson back down the hill. Mitchell’s brigade moves behind Whitaker and begins to deploy on Whitaker’s right.